Low-maintenance is often the top priority for many of us who don’t have the time or inclination to keep our homes and landscapes looking their best. 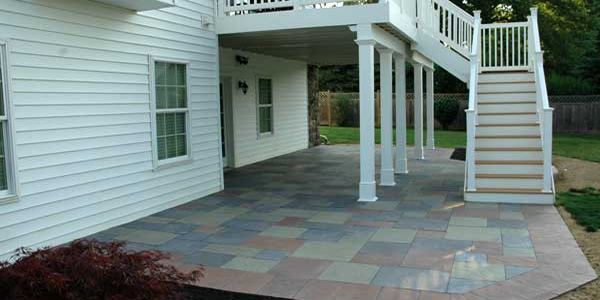 The photos in this blog show a great way to create a low-maintenance space under a deck, at a walk-out basement in Newtown, PA. The patio is built using EP Henry saw cut DevonStone. Pressure-treated deck post are wrapped in a cellular pvc product (Versawrap) by Versatex. The pressure-treated deck beam is capped in cellular pvc trim boards by Azek. Under the deck, DrySpace panels, by TimberTech, have been installed between the deck joists to direct water to a gutter, keeping the patio space beneath the deck dry. Planting beds have been edged with EP Henry Coventry Curbstone blocks to eliminate the annual chore of edging beds.